Photos have become one of the important things for people since all mobile phones now are equipped with at least one camera that keep being updated. For safely storing users’ images, Apple provides iPhone and iPad users with the feature of backing up pictures to iCloud. This is helpful in keeping the pictures safe and secure for a long time, as well as saving the device storage. However, when one needs some of the old iCloud pictures, it can be quite tricky for people to locate their targets among the sea of photo library, especially for those who are new to iPhone or iPad and not know much about iCloud. 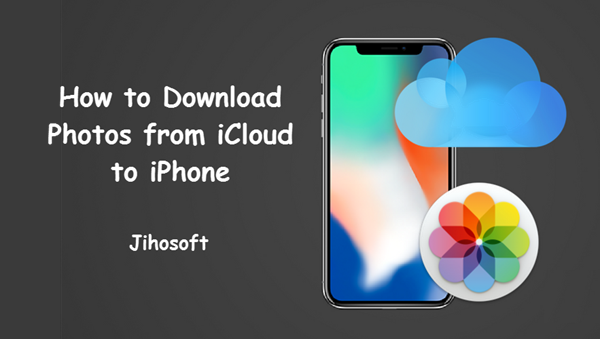 In this article, you will get the detailed steps to download photos from iCloud to iPhone or iPad regardless of the iPhone/iPad models or iOS versions they’re running on. 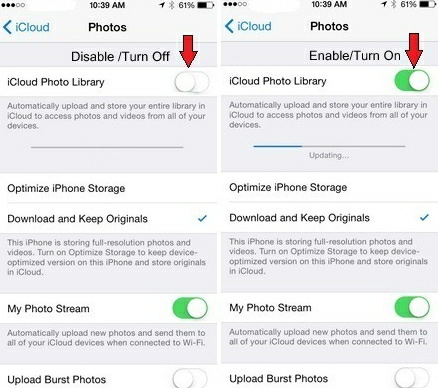 Pictures can be easily downloaded from the iCloud backup file to your iPhone/iPad unless you have turned on iCloud Photo Library. But you need to know that this method involving a restoring process that will first erase the existing data on your device , and then automatically restores all data including images from the old backup file. If you want to restore only the photos but not all contents from iCloud backup, you can skip to extract photos only from iCloud backup..
Go to Settings > General > Reset > Erase All Content and Settings. Then after process finished, from the page emerged, tap on Restore from iCloud Backup. Choose the exact backup you need to restore. Then your restoration process will get processed, and all the old photos will be placed again inside your iPhone. With the help of the iCloud Photos Stream, it is very simple to transfer all the photos from the iCloud to your iOS device, including those already deleted from your photo library. Of course, this method also has it defects like it only saves the recent 30-day photos taken on iOS device, due to the limitation of My Photo Stream itself. So it won’t be a good try if you want to get the old items. Usually we use the method when we transfer data from an old iOS devices to an new one, including iPhone, iPad and iPod Touch. Step 1: Make sure you have signed in with your Apple ID, and then go to Settings > iCloud > Photos. Step 2: Tap on the option Photo Stream from the list of available options if it’s not on (If your photos are still in the old iPhone, then you should do this step at that device). Step 3: After activation, all your photos from iPhone will get uploaded to iCloud which can be synchronized with another iPhone or Mac. You can easily get and transfer the images available in the iPhone Photos App using the iCloud Photo Library function. It is possible to free up a considerable amount of internal storage space by transferring pictures and videos to the Apple cloud service so to only leave small thumbnails on iPhone (the new and powerful ‘Optimise iPhone Storage’ option). iCloud service allows you to keep all your photos safe and can be transferred to your iPhone back whenever needed as long as the device is connected to network. You can find all the steps required to quickly download images and videos from iCloud Photo Library to your iPhone listed below. This step involves downloading the pictures from the iCloud photo library to iPhone’s camera roll. Step 1: The iCloud Photo Library should be activated from Settings > iCloud > Photos if you want to use this method. Step 2: If you chose ‘Optismise iPhone Storage’ before, then now you need to tap on Download and keep Originals to get all your photos back to iPhone. Step 3: Then open the Photos app and keep your iPhone network connection stable untill the downloading process finished. 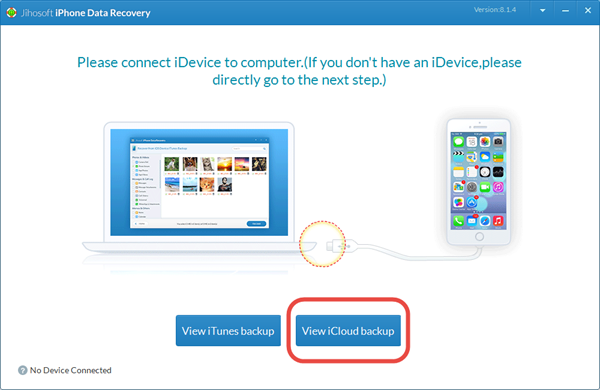 We have mentioned the photo downloading method from iCloud backup in the part 1. Although it’s undeniable that the method is useful in many cases, its defect also quiet annoying for its turn to factory resetting. To fix this issue, here we recommend you to use another valid way to only and efficiently extract photos from your iCloud backup, avoid any wiping or damage to your current iPhone data. This method involves Jihosoft iPhone Data Recovery, a poweful data recovery software built for iOS devices. It can recover important data like photos or messages from your iOS device, along with the ability of viewing and extracting files from your iTunes and iCloud backup. Here we will tell you how to view and extract photos from iCloud backup with this great software. Click on the Download button above to get Jihosoft iPhone Data Recovery software installed on your Win/Mac PC; then run it. Don’t connect with your iPhone; instead choose “View iCloud Backup” and sign in with your Apple ID. 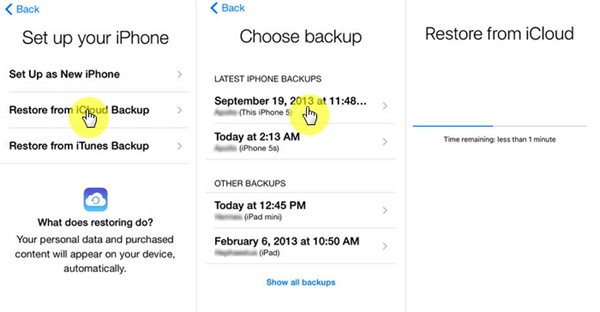 Click Start Scan after choosing your iCloud backup, and then view all your photos stored in iCloud backup. Seleect the photos you want, or expert all photos from iCloud backup to your computer. 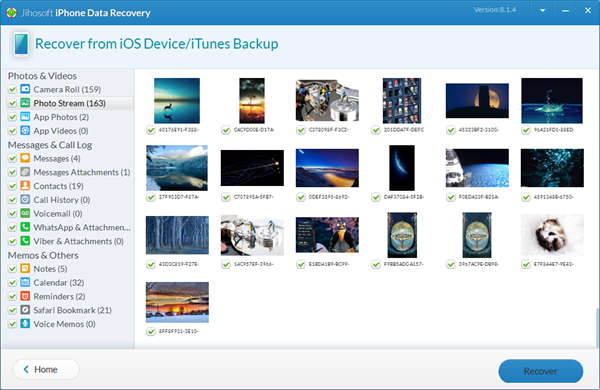 This software can also be applied to recover lost or deleted photos from iPhone or iPad. 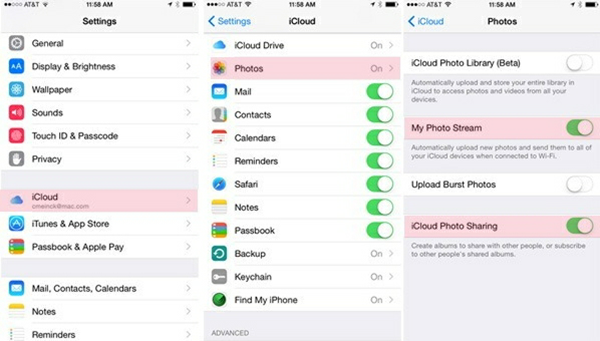 Apple provides iCloud service where you can store photos. It also enables you to synchronize all your data from other devices like Mac. You can easily download photos from iCloud to iPhone using simple techniques explained in this article. All these methods are secure and safe, commonly used by most iPhone users. You can use these methods to download your pictures from iCloud and share your experience or questions in the comments. Please let us know if you found any other method to download photos from iCloud to iPhone.